Last night, at about 11:00 as I was stumbling around the backyard trying to hide Easter Eggs in places they wouldn't get sprayed by the sprinklers this morning, I realized what Easter has become. 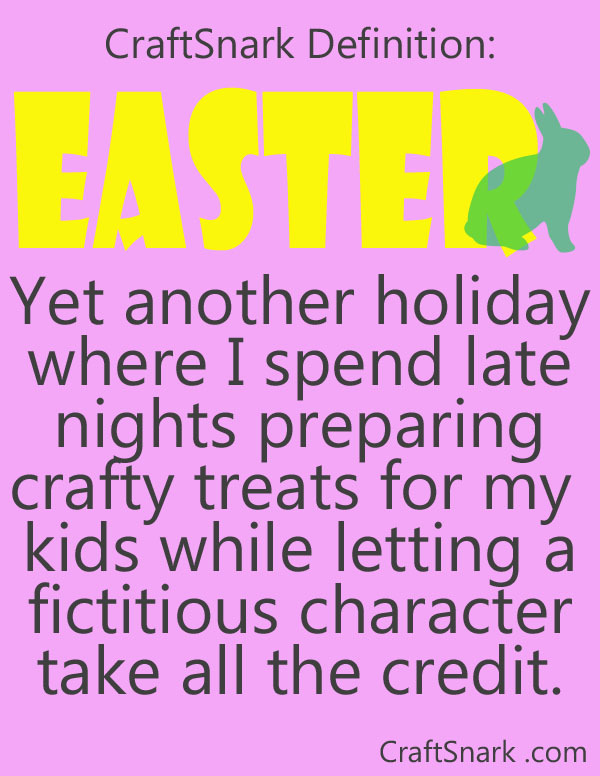 I have things that need doing, projects that need finishing, e-mails that need writing, but I also want my kids to have a good Easter. So after the kids go to bed, I create Easter baskets, fill plastic eggs, decorate the Easter table, and get my bunny on. In the morning I'm greeted with "This is AWESOME!" and "I LOVE the Easter Bunny!" Which is fun. Until a few hours later, after the chocolate egg and jellybean-fueled race around the backyard is over. That's when I get the sugar-crashed kids who won't listen, won't nap, and spend the afternoon pestering each other. My children will only be small for a short while, so I enjoy these opportunities to be part of the magic. It just feels like I'm getting the short end of the wand.